Tygon 2375 Tubing + CNC Aluminium Hose Plug + Stainless Hose Clamps. Tygon 2375 Tubing is an Ultra Chemical Resistant Tubing in a clear flexible tubing that is virtually unaffected by acids, bases, ketones, salts, brake fluid and alcohols. This latest formulation 2375 replaces 2075. Many racers use this tubing for non pressurized brake fluid connections, like connecting your remote reservoir to your master cylinder or to replace the reservoir all together with the CNC aluminium hose plug and clamps included. Please note that this tubing has branding and information printed in green on the tube. Although this tubing is brand new off the roll it may contain small scuffs and scratches from production and manufacture. Both of these are outside of our control and is to be expected from an industrial product. Resistant to MEK and other highly aggressive chemicals. Tubing is virtually unaffected by acids, bases, ketones, salts and alcohols (See chart below). Prevents fluid contamination from leaching plasticizers - a common occurrence with other flexible tubings. Eliminates premature cracking of embrittlement due to plasticizer extraction. Extremely smooth inner surface: Inhibits particulate build-up. Hydrophobic property reduces absorption of aqueous fluids. Minimal out gassing from tubing. 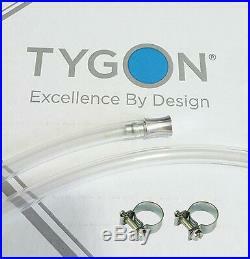 The item "Tygon 2375 tubing 8mm + ALUMINIUM PLUG+SS CLAMPS reservoir hose ID 30cm TBE. 012" is in sale since Monday, September 21, 2015. This item is in the category "Vehicle Parts & Accessories\Motorcycle Parts\Brakes & Brake Parts\Brake Lines & Hoses". The seller is "darkicedesigns" and is located in Buckingham. This item can be shipped worldwide.